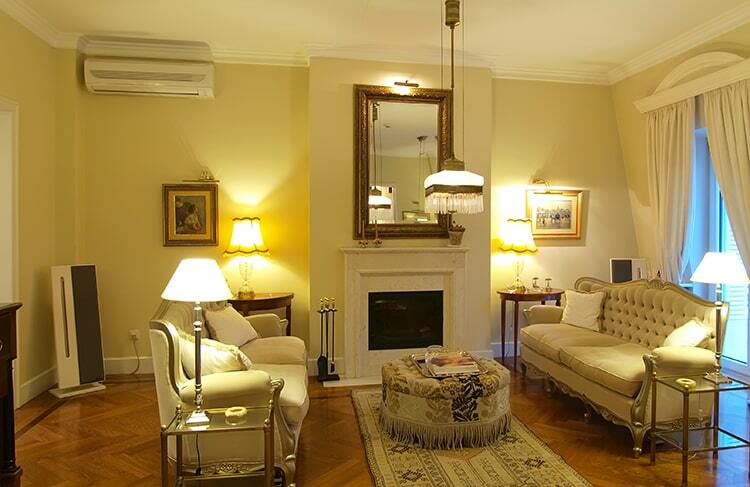 Ductless mini-split systems work a little differently than your typical HVAC system. Ductless systems consist of a compressor installed outside your home and separate wall units that are installed inside of your home. Each indoor unit creates a “zone” that heats or cools independently from the rest of the units. With the capability of setting different temperatures in each room, everyone can be comfortable – not to mention enjoy the savings on energy bills by limiting heating or cooling to rooms that aren’t being used. Ductless mini-split systems do not require ducts to distribute air, which makes them the perfect solution for home additions, renovations, older homes without air conditioning, sunrooms, enclosed porches, attics, basements, garages, and any space where adding ductwork would be too costly or difficult. Whether you are looking to add mini-split heat pumps to your whole home or new construction, or are retrofitting to an older home with no ductwork, there are many benefits you can enjoy by going ductless! High Efficiency and Energy Savings! Most heating and cooling systems run at full capacity every time they turn on, wasting a lot of energy. 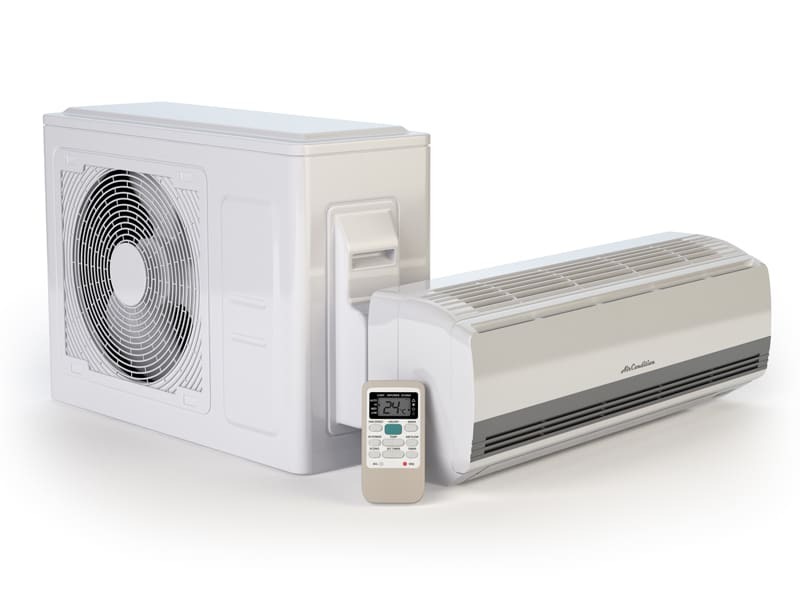 Ductless mini-splits are unique because they only run to meet the temperature demands of each zone – saving homeowners money by not heating unused space at full capacity. A mini-split system also eliminates the need for a backup heat source since they run solely off electricity, even when the temperature drops below 0 degrees. No ductwork is needed for this system to distribute warm or cool air throughout your home. This makes a ductless mini-split system perfect for home additions, renovations, and older homes where it wouldn’t make sense to extend or add a duct system. Tired of hauling the AC window units from the basement or storage shed? With a ductless mini-split system, you’ll never have to install or winterize those window shaker units again. Plus, mini-splits use a fraction of the electricity to operate! The ductless mini-split units have a sleek-attractive design, and take up minimal space. The outdoor component is much smaller than a typical HVAC unit, and the indoor units are small enough to fit in spaces above doorways or below windows. There are several options for the indoor units, so you can choose the best fit for your home. The “zoning” ability allows you to set different temperatures in different parts of your home. No more fighting over the thermostat – you can have different rooms set at different temperatures, so everyone in your home is comfortable. Most people can barely hear the system running, so you can install the units anywhere without having to worry about it waking you up in the middle of the night or disturbing your daily routines. Ductless mini-split systems offer efficiency and comfort in a way that standard HVAC systems often lack. Mini-splits provide the ability to zone your home, which means that you only heat or cool the rooms that you are using. This alleviates a lot of wasted energy to heat or cool the entire home at one time. The ductless mini-split system consists of an outdoor compressor called an “inverter” and a set of indoor units that can be installed throughout the interior of your home (usually 3-4 indoor units per outdoor inverter). Each indoor unit comes with a remote that acts as a thermostat. You can set the temperature for each indoor inverter individually, to create your different “zones.” This means that you can set the temperature in one part of your home at 65 degrees, and another part of your home at 75 degrees. With this system, everyone in your home can set the temperature for their comfort level, without having to change the temperature of the entire house. Ductless mini-split systems are a type of heat pump that requires little to no ductwork. There are two major cost savings opportunities for ductless-mini split systems vs. your typical central air system. 1. Installing new ductwork or adding on to existing ductwork is very costly. Not only is it costly to install new ducts, but you may also have to upgrade your existing HVAC system to compensate for the additional heating and cooling space now required by the unit. 2. High energy loss associated with the ductwork of central forced air systems. Ductwork accounts for more than 30% of energy consumption for space conditioning – and it is even higher for uninsulated spaces in attics or basements. With a mini-split system, there is little to no ductwork needed – eliminating the installation and construction costs of new ductwork. Ductwork also is a source of energy loss, by eliminating ductwork with a mini-split, your home will operate more efficiently – saving you on your energy bills! Why SMO Energy for Your Ductless Mini-Split Installation? We are enthusiastic professionals, who love to help our customers make smart-home investments. Let our highly-trained energy consultants walk you through the option of adding a ductless mini-split system to your home. If a ductless system isn’t right for you, we’ll walk you through HVAC alternatives to help make your home more comfortable. We are a family owned company, currently headed by the fourth generation, and locally operated in Southern Maryland. We’ve had the pleasure of serving Maryland since 1926, with top-rated customer service. We look forward to serving many more generations to come and hope to have you as part of the SMO Energy family.